In our NBA Finals column series on the site so far, we've covered a Shaq and Kobe title victory, D. Wade's first championship, Kobe's 5th title, and 4 of Jordan's 6 championships. Well, today we make it 5, as we discuss the 6th and final title win for the Chicago Bulls and Michael Jordan. Two 3-peats completed over the course of 8 seasons, is absolute greatness. After defeating the Utah Jazz the previous year to win their 5th title, the Bulls were on a mission to yet again make history. As the season came to a close, the Jazz and the Bulls seemed pretty equal, unlike the previous year. 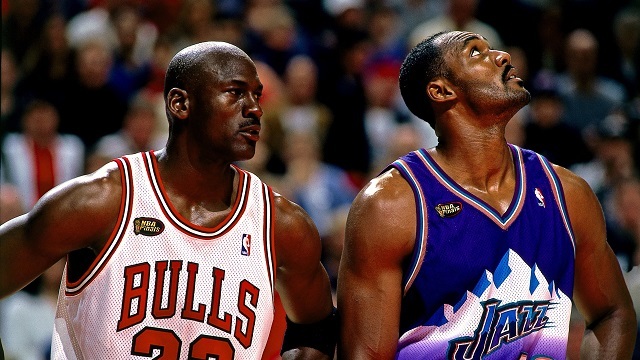 In the 1996-1997 season, the Bulls finished 69-13 and easily would be the favorite to win the title, but the 1997-1998 season saw both teams finish with a 62-20 record to take the respective no. 1 seed in their conference with the Jazz having home court advantage by winning both their regular season match ups. The playoffs would start off tough for the Jazz, as they were barely able to get out the first round with a 3-2 series victory over the Houston Rockets before making quick work of the Spurs in the semifinals in a 5 game series. They would sweep the Lakers in the conference finals to make it back to the finals yet again. The Bulls started off easily with a first round sweep of the New Jersey Nets, before a 5 game semifinals win over the Charlotte Hornets before winning a tough hard fought 7 game conference finals series against the Indiana Pacers. As both teams prepared, a rematch was set and the prize was the NBA Championship. 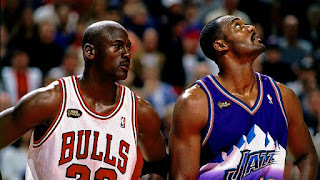 The starting lineup for the Jazz would feature Karl Malone, John Stockton, Jeff Hornacek, Greg Foster, and Adam Keefe. The Bulls starting lineup would feature Jordan, Pippen, Ron Harper, Luc Longley, and Dennis Rodman. Game 1 was upon us and the Jazz were riding a wave of rest (9 days)and a 6 game winning streak, while the Bulls were running on 2 days rest only. History was to be made. -Live from Utah, game 1 had the Jazz looking like they were on their way to championship glory. The Jazz got a solid game from Karl Malone with 21 points and 14 rebounds, despite having a bad shooting night, and a good game from Stockton, with 24 points and 8 assists. Pippen would finish with 21 points for the Bulls, while Jordan would put up 33 points in a disappointing overtime loss to the Jazz, 88-85. The Bulls were down 1-0 and knew they had to come back with a vengeance in game 2. -With their focus back on, the Bulls looked a bit better in game 2, as they would pull out a 93-88 victory to even up the series at 1-1. In rebounding from their game 1 loss, we would see Jordan put up 37 points to carry his team to the win. For the Jazz, game 3 would now be pivotal for them as they needed to secure a win and recover the momentum they gained with game 1. -With the series tied 1-1, and both of the first 2 games being extra competitive, you would expect game 3 to be a close one down to the wire. Unfortunately, that would be incorrect, as the Bulls massacred the Jazz in a history making game by 42 points, 96-54. With the series now in Chicago, we knew the Bulls would play hard, but their defense was way too much for the Jazz to compete with. The Bulls would beat the Jazz with the widest margin ever in a NBA Finals game, led by Jordan with 24 points and Tony Kukoc provided 16 points as well. The Bulls were now up 2-1 and the Jazz had their back against the wall going into game 4. -With the momentum totally in their favor after the annihilation of the Jazz in game 3, the Bulls would play yet another solid game in game 4 to take a victory, but the Jazz showed up to play this time at least. Competing for the entire game, it all came down to the final minutes, but the Bulls would manage to finish with an 86-82 victory to take a convincing 3-1 series lead. Jordan finished with 34 points, Pippen came strong with 28 points, and Rodman would pull down 14 rebounds as well as hit clutch free throws to secure the win. For the Jazz, they were in a familiar place, being down in a NBA Finals series to the Bulls and it seemed a repeat of last year was imminent. Could the Jazz make a comeback in the series? 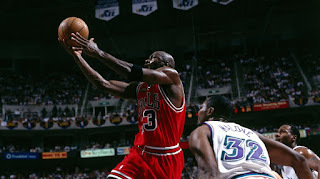 -The Bulls looked to close out the series and another 3-peat at home, and it looked as if that would possibly happen, as the Bulls and Jazz would compete heavily during the whole game, but the Bulls would come up just short after Jordan missed a three pointer at the buzzer to win. The Jazz had a convincing lead going into the 4th quarter, but the Bulls started a run, however it just wasn't enough and the Jazz won 83-81 to make the series 3-2. 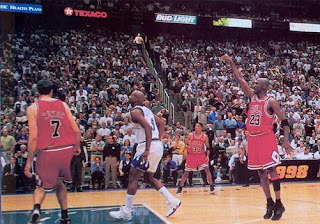 The Bulls were led by Tony Kukoc with 30 points, and Jordan who put up 28 points. 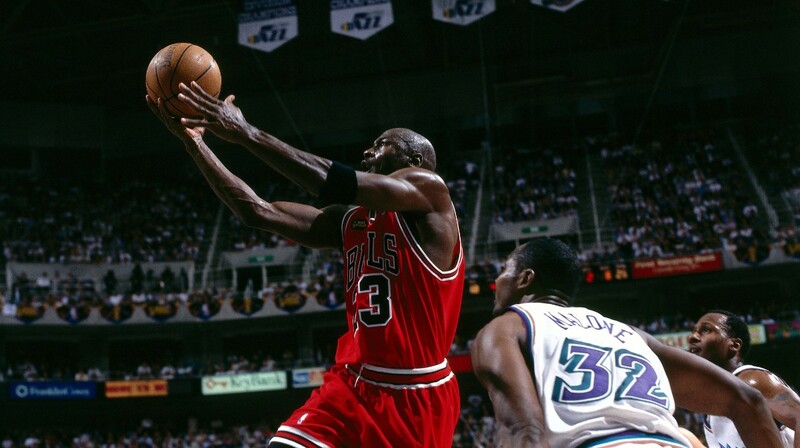 The Jazz were led by Karl Malone's 39 points and Antoine Carr provided 12 points off the bench. With game 5 in the bag, would the Jazz be able to come back home to Utah and even the series in game 6? 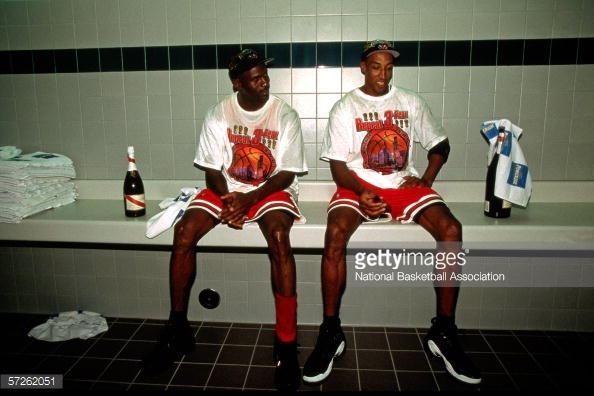 Or would the Bulls celebrate their 6th title in 8 seasons and their 2nd 3-peat. -We all know the story. We all know the history. 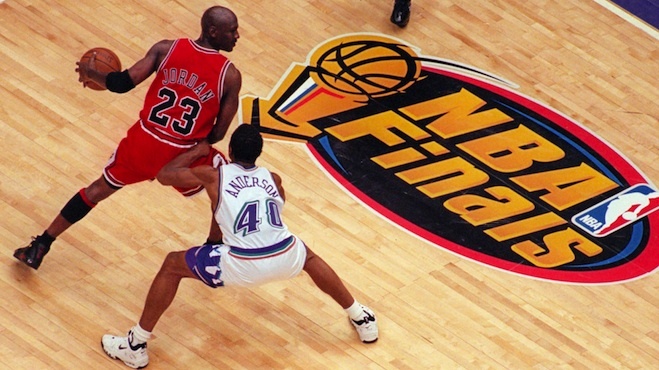 Game 6 of the 1998 NBA Finals could possibly be Michael Jordan's finest hour ever. Pippen aggravated an injury early on in the game, so Jordan would carry the team yet again, scoring 23 points in the first half. 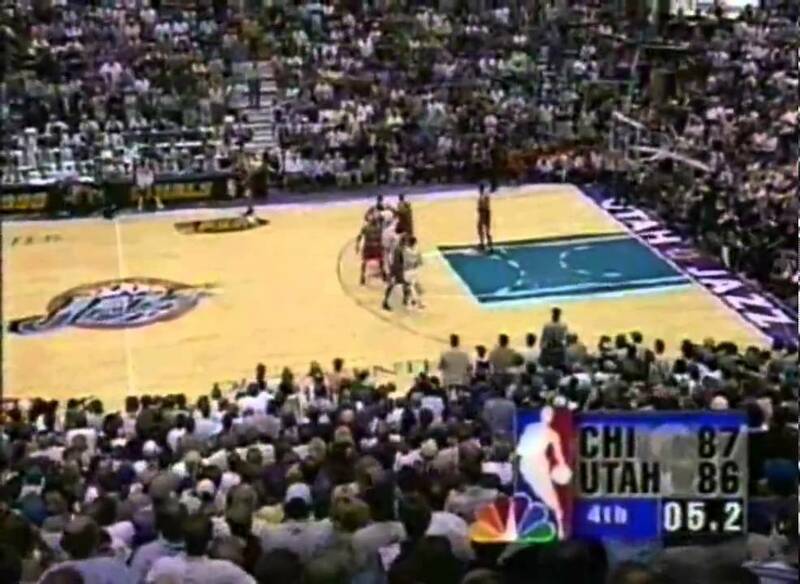 The Jazz would be able to keep up the entire game, and even took a 86-83 lead with 41.9 seconds left in the game off a John Stockton three pointer. However, Jordan would make it 86-85 after a layup, then manage to steal the ball with just a few seconds left to go in the game. It all came down to this. Either a game winning shot, or we would see a game 7 situation. 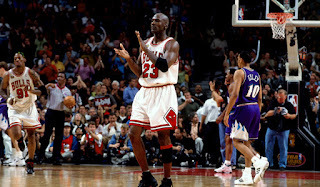 As Jordan walked up the court, defended by Bryon Russell, he waited, dribbled, crossed over Russell(while giving him a slight push off) and hit the game winning jumper to make it 87-86 with 5.2 seconds left on the clock. Stockton missed a three pointer to win, and the Bulls won game 6 and the NBA Championship to complete their 2nd 3-peat and win their 6th title in 8 seasons. 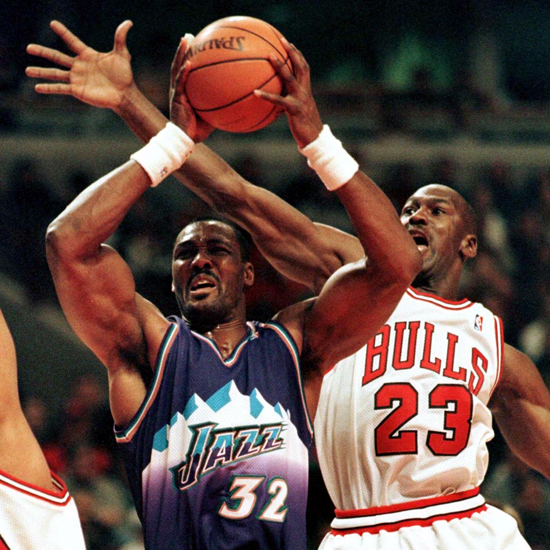 For the Jazz, it was another heartbreaking loss, as they were led by Karl Malone's 31 points. 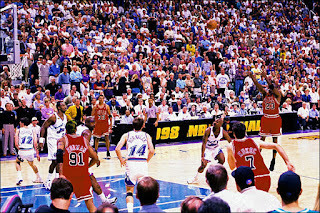 The Bulls were led by Jordan of course, who finished with 45 points in a magnificent performance, possibly his best in the Finals ever. 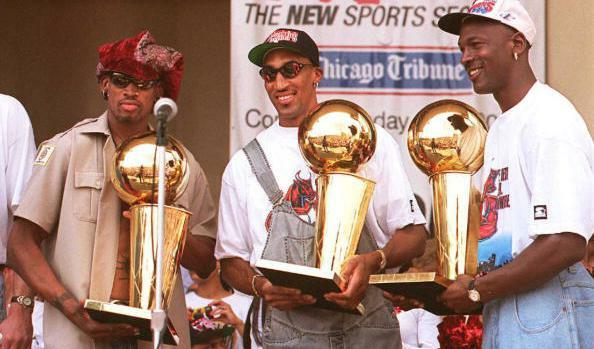 For the Bulls, and Jordan, this was the end of an era. Jordan would win Finals MVP, then in January 1999, retire from basketball yet again. After making history and solidifying his legacy as the greatest, Jordan would walk away from the game(for some years), and the Bulls dynasty would officially come to an end after Pippen was traded and Rodman was traded as well. It was truly the end of an era, the likes of which we have yet to see again. 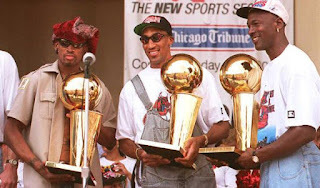 Your 1998 NBA Champions, the Chicago Bulls! !